Grapevine, TX, January 14, 2019– Network Thermostat introduces new NetX X7 Thermostat at the 2019 AHR Expo in Georgia World Congress Center, Atlanta, GA. 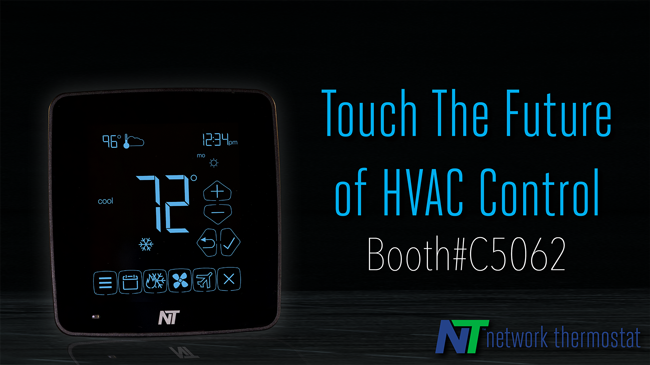 The NetX X7 is the most advanced, powerful single platform design in the HVAC marketplace. The 8 schedules per day, 40 calendar events, and 40 special events system is the most power Network Thermostat has ever placed in a thermostat. The NetX X7 uses commercial grade hardware with real switching relays and non-volatile memory for guaranteed performance and reliability. Our distributed architecture with onboard memory ensures continued control during network and internet outages. The NetX X7 has the flexibility to be managed from the cloud or most securely running behind your network firewall. A full remote sensor bus with advanced status monitoring and real-time system alerts ensure the NetX X7 performs as you expect. Like the rest of NetX Thermostats, the NetX X7 has multiple connectivity options. Connect the NetX X7 with Ethernet or Wi-Fi. Control the NetX X7 directly, via the cloud or securely behind your network firewall. You can even control the NetX X7 via BACNet or use our API to control and respond to ADR requests. Since 1995, Network Thermostat™ maintains the position of industry leader in providing Internet Thermostat solutions for facilities, small businesses, and commercial or light industrial applications. Our award-winning products and technologies give simple, reliable HVAC controls, anywhere and anytime, to maximize energy savings while providing comfort to the occupants – This Changes Everything. If you would like more information about this topic, please contact Paul Sonoda at 214-612-7266 or email at psonoda@networkthermostat.com.